I don’t really like turkey. I know, I know….your probably wondering if I am even an American. (I have a fully certified birth certificate from the great state of Texas I would be happy to show you!) Anyways, I don’t know what it is about turkey but I just don’t think it taste great. Good thing we only eat it once a year. 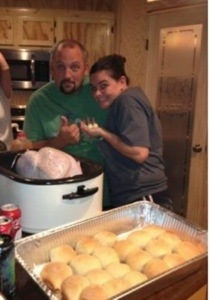 Well, last year my awesome husband was determined to make a turkey that I would like. So his solution was to try to make it taste like bacon. Well, who could possibly refuse that? I mean I’ve had turkey bacon before, but this went to a whole new level! It didn’t quite taste like bacon, but it was delicious. Make sure and reach into the cavity of the bird and pull out the little bags of “extras.” Pour your apple cider inside the turkey. Cut slits in the skin of the turkey and tuck in your peeled garlic cloves. We put them all over! Then, sprinkle your turkey with salt and pepper. 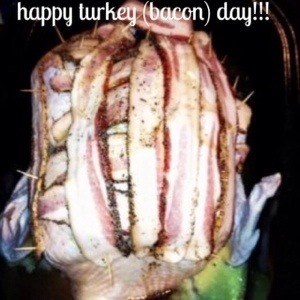 Take your strips of bacon and lay them across your turkey. We did it both ways; across the sides and top. Use some toothpicks to hold your bacon in place. We had a couple of pieces left so my husband shoved them inside with the apple cider. 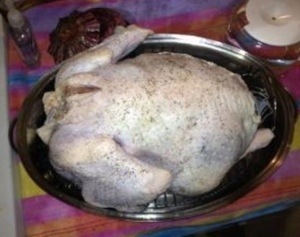 Cook your turkey for about 20 minutes/per pound or until the center temperature reaches 165 degrees. I always cover my turkey with bacon, it not only gives a great flavour, but it makes the turkey self basting. Once the bacon has done its job and it is time to crisp/brown the skin, I cut the bacon up and throw it in the drippings, Bacon Turkey Gravy!!! !